This time last week, my husband David and I were in Nassau, Bahamas. 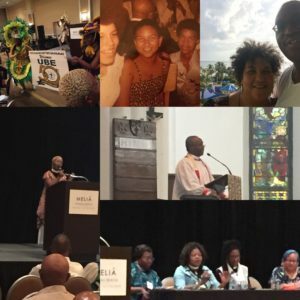 No, we weren’t on vacation—we attended the 50th annual conference of the Union of Black Episcopalians or UBE. Growing up, I thought everyone knew what UBE was. Now, I realize that many in the church have never heard of it, or don’t see why it’s still relevant. Let me share a little about UBE, and why it is essential to The Episcopal Church. UBE’s primary goal is to teach black people how the governance of the church works—notably, General Convention. Black deputies get lots of support from UBE leadership. UBE is a place for black clergy and laypersons to gather for workshops, panel discussions, and plenary sessions about topics relevant to us in today’s worship community. UBE offers a space for us to worship together with the music of our elders and ancestors. The Union provides a welcoming environment for anyone in the black Episcopal community and those who work in it. UBE was fuel for my family and became our vacation each summer. As a black girl growing up in the 1970s and 80s, I loved going to UBE. The other regular attendees became family—some, quite literally. David and I met 37 years ago at Chatham College in Pittsburgh when I was 14, and married twelve years later. Mentors, teachers, and spiritual guides surrounded me as I grew from an awkward, shy teenager into an awkward, shy adult. I carry their lessons with me today and impart them to others. Honestly, I owe my life as I know it to UBE. This 50th-anniversary conference was my first conference in many years, and I’m happy to say that the spirit of UBE is unchanged. I saw lots of new faces and many old family friends. At the Forward Movement exhibit table, I met new clergy and seminarians, longtime readers of Forward Day by Day, and several aspiring writers. You may have heard about the worship service last Monday evening at Christ Church Cathedral with Bishop Curry—it was phenomenal. I felt so uplifted and refueled—just like when I attended as a youth years ago. The church is better when all of our voices are heard, and I’m proud to be an Episcopalian at a time when we care very seriously about diversity in The Episcopal Church. But even if we realize true ethnic equality, there will be a need and a place for UBE. Thanks be to God for all of the leaders of UBE past and present. Congratulations, Union of Black Episcopalians, for 50 years of ministry! We’re proud to be your partner as you enter your next 50 years. Miriam McKenney serves as Development Director of Forward Movement. Faith with a Twist: A 30-Day Journey into Christian Yoga seeks to bridge the gap between spiritual-but-not-religious by blending the ancient church’s wisdom and the spiritual practice of yoga. All too often attempts to blend yoga and Christianity have failed to do justice to both traditions — often sacrificing the wisdom of one tradition for the other. 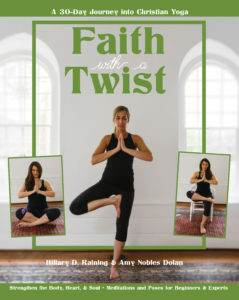 Faith with a Twist connects the traditional eight limbs of yoga with the church’s understanding and emphasis on living a holy life. This approach creates a unique blend of spiritual practices and religious wisdom that are perfect for the yoga novice and the experienced practitioner alike.